Renu Herbs Detox Tea: Can it Really Help Purge Toxins from the Blood? 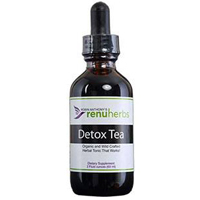 Renu Herbs Detox tea is a part of a rapidly growing category of cleansing beverages which claim to clear out toxins from the bloodstream, promote better overall health and encourage weight loss. This is a highly controversial category as the actual concept of detoxifying the body in this way has been called into question both in terms of actually working and in terms of offering any real benefits. The official webpage for this product on the Renu Herbs website by Robin Anthony claims that the blood is full of toxins such as artificial food ingredients, chemicals and pesticides. It claims that by drinking this tea, these toxins will be cleansed away in order to avoid the serious health problems they have been causing such as: chronic fatigue, headaches, obesity, heart disorder, allergies, high blood pressure and hangovers. As much as that may sound believable as there are many chemicals in our air, water and food supply, the effectiveness of these types of teas is still difficult to believe. Especially when considering the ingredients in Renu Herbs Detox Tea. At the time this review was written, they consisted of: rhubarb, burdock root, sorrel, slippery elm, and red clover. It is highly unlikely that any licensed doctor would agree with these claims or recommend a product that makes these types of promises. This is rather dubious advertising considering that there isn’t any scientific evidence to support the use of those ingredients. While some may say that a product doesn’t need a study to be effective – and that is very true – by researching ingredients and a complete formula, it becomes possible to know how much of an ingredient is actually needed in order to make it effective, how much could cause side effects, whether there are possible interactions with other medical conditions, supplements or drugs, and whether it is safe to use over time. Without that information, for all this company knows, even if every one of those ingredients has the potential to be effective, they might not have used enough of them to produce any effect at all.